This week’s Accidental Locavore Cook-Along recipe continues the Marcus Samuelsson theme, and is taken from his cookbook New American Table that we were given at the Red Rooster Harlem event. Of course I picked the recipe least likely to be considered American…Pad Thai. My excuse? I’ve always wanted to try my hand at Thai food, and this recipe was a convenient excuse. 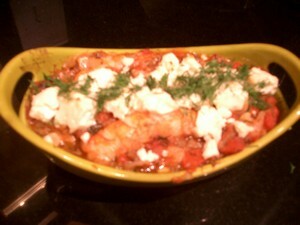 This is a great dish to make when you feel like wielding a knife in the kitchen, and the bonus? It’s a super easy and quick recipe once you’ve gotten everything prepped. The chopping and prep work took about a half an hour at a leisurely pace. The downside? Lots of pans to clean, so you make the Pad Thai and con someone else into the clean-up. Serves 4-6 according to the book, seems like 4 good sized portions to me. In a medium pot soak the rice noodles in 4 cups of hot water until softened, about 10 minutes. Strain and set aside. Heat a large saute pan over high heat. Add the peanuts and toast until golden and fragrant, about 3 minutes. Remove from heat and set aside. Whisk the eggs together. Heat a nonstick saute pan over medium heat (not having a small nonstick saute pan, I sprayed mine with Pam, next time will probably just use a little oil, or a bigger nonstick pan). Add the eggs and cook until done about 3 minutes (you’re making scrambled eggs here). Remove from heat and set aside. Heat the vegetable oil in a large saute pan over high heat. Add the ginger, garlic, and chiles and saute until fragrant 3 to 4 minutes. Add the chicken and peanuts and saute until the chicken is cooked through, about 6 minutes. Remove the pan from the heat and add the rice noodles, eggs, shrimp paste, fish sauce, tamarind paste, soy sauce, sugar, tofu, scallions and cilantro. Toss gently to combine. Drizzle the chile vinegar. Serve over the lettuce and with the lime wedges. Enjoy. Combine all ingredients in a small saucepan and bring to a boil. Reduce the heat to a simmer and cook for 2 minutes. My rating: 3 stars. Mostly because the rice noodles were too stiff. They probably needed boiling water, and more than a 10 minute soak. 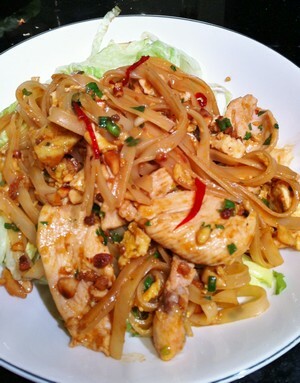 This was spicier pad Thai than you usually get from a Thai restaurant which was fine by me. I would definitely make it again, but might substitute boneless, skinless chicken thighs. Getting the ingredients was a bit of a challenge, but I love this little grocery in Chinatown, and once you get all the stuff, you have it (the chiles can be frozen). Added bonus, there’s a Chinese bakery on Mott Street of Bayard that has amazing pork dumplings to take home. Frank’s rating: 3 1/2 stars. Same issue with the noodles, and he thought there were too many peanuts, which is easy enough to fix. Potato gratin to go with rack of lamb for Valentine’s Day, what’s a better combination? So the Accidental Locavore went straight to the source for this week’s cook-along recipe, Julia Child’s Mastering the Art of French Cooking. 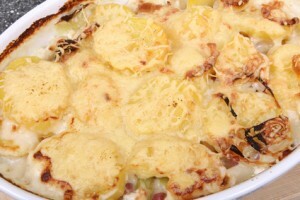 I wanted a recipe for a classic French potato gratin and found it with the Gratin Dauphinois. The only major change I made with it was to omit the cooking on top of the stove as I’m sure the gratin pan I have wasn’t flameproof, so I just cooked it in oven a little longer. The book says for 6 people, maybe my guests were just hungry, it fed 4. Adapted from Mastering the Art of French Cooking. Preheat the oven to 425 degrees. Peel the potatoes and slice them 1/8″ thick. Place them in a bowl of cold water, and drain when ready to use. Rub the baking dish with the cut garlic. Grease the dish with 1 tablespoon of the butter. Drain the potatoes and dry them with a towel. Spread half of them in the dish. Sprinkle half the salt, pepper,cheese and butter over them. Add the rest of the potatoes, and cover with the rest of the cheese, butter, salt and pepper. Pour the boiling milk over the potatoes. Julia says to set the baking dish over heat and when simmering move to the upper third of the oven and bake for 20-30 minutes or until the potatoes are tender, the milk is absorbed, and the top is browned. I just popped them in the oven and cooked them until they were browned, about 30 minutes. Serve and enjoy. My rating: 3 stars. The potatoes were a little overcooked, and there was no sign of the cheese. Next time, I would use more cheese, and maybe substitute cream for the milk. A little fresh thyme and/or nutmeg might help. It may have been the potatoes I used, but the dish was kind of watery. However, potatoes with cheese, milk and butter, how bad can it be? I’ll definitely keep rubbing the cut garlic on the baking dish. Short ribs, don’t you love them? 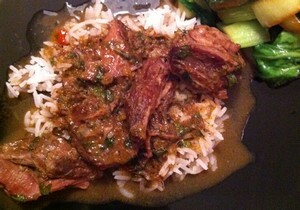 When the Accidental Locavore saw this recipe from Tasting Table, it was only a matter of time before this recipe for coconut curry short ribs made it onto my dining table. Like most short rib recipes, this one is pretty easy, but it’s a long 3-4 hour, cooking time, so plan accordingly. The recipe calls for doing them in a Dutch oven, and I did sear and finish them in mine, however so they didn’t have to be tended, they went in the slow cooker, and came out great. To go with, some baby bok choy, sliced horizontally, sauteed with a little minced garlic, and ginger, and finished with some soy sauce and hot sesame oil. Served 3 with not much left over. 1 tablespoon brown sugar (I used light brown, but think dark might have been better). Preheat the oven to 275. In a blender or food processor, combine the curry paste, ginger, scallions, garlic, and water, and process until smooth. In a large Dutch oven, heat the vegetable oil over high heat. Salt and pepper the short ribs. When the oil is hot, add the ribs and cook for about 4 minutes a side to brown them. When the ribs are browned, pour off the excess fat from the pan. Add the chicken stock, lemongrass, and the curry mixture from the blender. Bring to a simmer, cover, and transfer to the oven. Cook until they are fork tender, about 3-4 hours. If you’re using a slow cooker, brown the short ribs in the Dutch oven, then transfer them with the above ingredients to the slow cooker. I started mine on high, and turned them down after an hour, if you don’t want to tend them, just put them on low. Transfer the short ribs to a cutting board and shred the meat into large pieces. Skim the excess fat from the cooking liquid. Add the meat back to the cooking liquid, and add the coconut milk, brown sugar, jalapeno, cilantro and the lime juice. Cover and cook until the stew is hot but not boiling about 5 minutes. Serve over rice, and enjoy. My rating: 4 stars. Because they were in the freezer, I tossed some Thai kaffir lime leaves into the pot with the lemongrass. The recipe says to leave the lime juice out if you are saving some of the ribs and to serve them with lime wedges, so that’s what I did. I’m not sure if I would go to the trouble of shredding the meat the next time I make this. It’s nice to have the short ribs with the bones. At the end, I left the ribs in the Dutch oven on low heat, uncovered, for a while before serving them, and they were fine. When I make them again, if I use the slow cooker, I would just add everything to the slow cooker, cover it, and let it run on slow for a few minutes. Frank’s rating: 4-41/2 stars. He didn’t give it 5 stars because he’s saving that rating for something spectacular. That being said, this was his favorite of the cook-along recipes so far.